The two photographs below were taken at SW 10th and Morrison in Portland Oregon, the first in 1949, the second in 2006. The same street corner in the same city but in very different worlds. The photos show that even with many of its elements present, the past is elusive quarry. 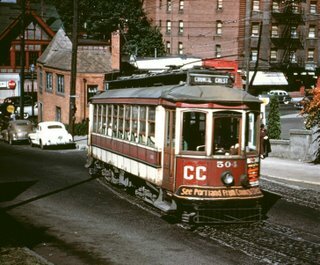 In the first picture, Portland Traction car #504 is inbound on SW Morrison crossing SW 10th on the Council Crest Line. Forty minutes before the photograph was taken it had departed Council Crest Park high in Portland's West Hills, surrounded by the panoramic views of the city, the rivers, Washington County, Mt. Hood, Mt. St. Helens and Mt. Adams. Car #504 was built by the American Car Company in 1904 specifically for the steep hilly line to Council Crest. An amusement park was built there at the summit in 1907. By 1949 though the carnival rides and attractions had been gone for over two decades. In 1950, a year after the photograph was taken, both the #504 and the Council Crest Line would be scrapped. The second picture is of Portland Vintage Trolley #512, one of four replicas based on the Council Crest cars. It was built in 1991 by Gomaco Trolley Company of Ida Grove Iowa. On Sundays, two of the cars run on the Max tracks between Downtown and Lloyd Center. For six blocks on SW Morrison Street, between 5th and 11th the line travels a small portion of the original Council Crest route. Despite the outward similarities there are significant differences between the two cars. The rails the #504 traveled on were only 42 inches apart as were most of the old city streetcar lines in Portland. The #512 rides on rails 56 and a half inches apart, the standard US railroad gauge. At 40 feet in length, the #512 is two and a half inches longer than the #504 but it outweighs its predecessor, 55,000 to 39,460 pounds. With its Oak woodwork and wicker seats, its interior of #512 is a very impressive replica of the originals. Both cars seat 40 people. The placard on the front of #504 with the bright orange lettering promotes Windoph’s Used Cars: “Ride Better in a Guaranteed Used Car” while the #512 advertises Portland General Electric in a more discreet way on its sides. The cars destination signs read “Council Crest” on the #504 and “City of Roses” on the #512. Both proclaim “See Portland from Council Crest” across their front fenders. The two cars are going in opposite directions. SW Morrison was still a two way street in 1949. 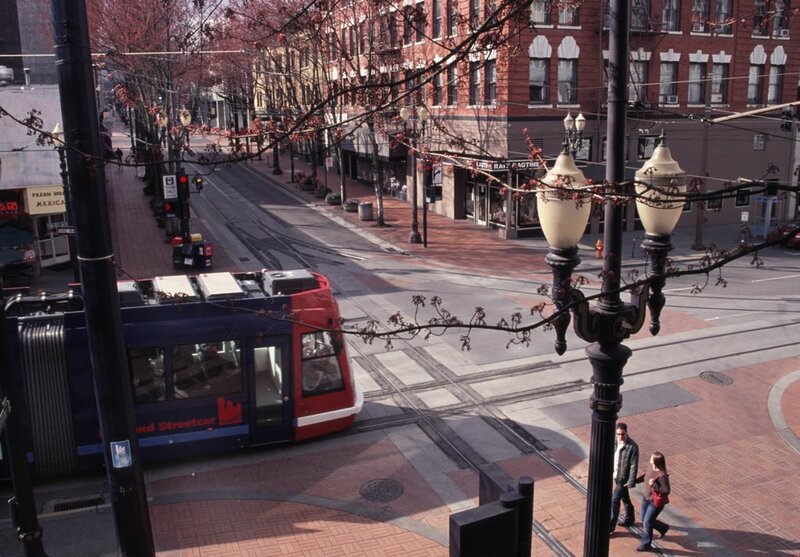 The one-way street grid in downtown Portland would be adopted a year later. 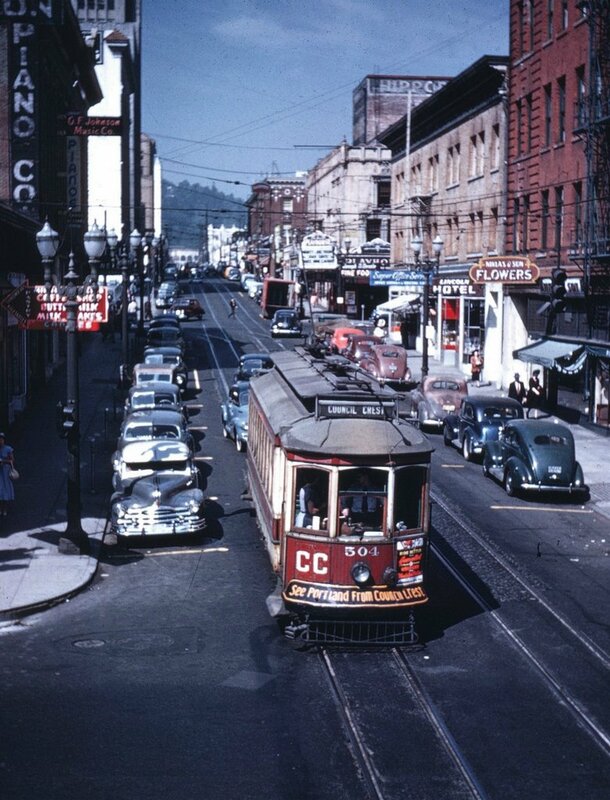 More than any pressing need for modernization by the Portland Traction Company, it was the city’s implementation of the one way street grid that spelled the end of the final three streetcar lines (Council Crest, Willamette Heights and 23rd Avenue) on February 26th 1950. 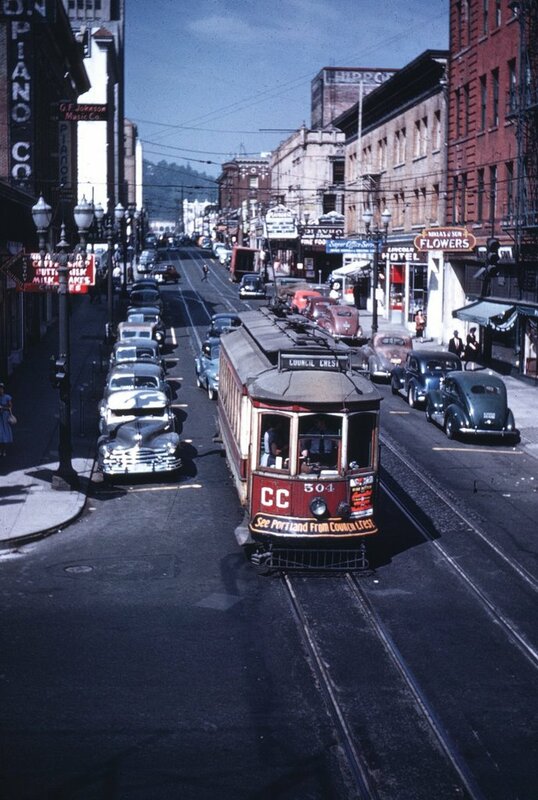 One-way traffic flow was incompatible with the streetcars, which had double track for two-way operation. The red sign to the left of car #504 points to Blazier’s Cafeteria (a.k.a. Blazier’s Millionaire). Today it is the location of Maya’s Taqueria. During World War II it was known as the Millionaire Club and in the early 1930’s, the Hob N’ Nob. The restaurant closed in 1953. The Oregon Music Company, sellers of “Pianos, Organs, Radios and Televisions” would replace it. In the top left hand corner of both photographs is the Terminal Sales Building, two blocks away. In the distance, above Morrison Street in the1949 picture is Civic Stadium, now PGE Park. Then, as now, the brick building on the right was known as the Fine Arts Building. Today the ground floor is home to Ray’s Ragtime (a vintage clothing store), 3rd Girl Designs, (self-described as a “Gay Pride store”), Istanbul Jewelry & Gifts and Restoration Antiques. In 1949 the L.D. Heater Music Company and Niklas & Son Flowers shared the street level. The buildings upper floors were filled with music, dance, opera and band studios and teachers. It is still somewhat so today although there are more offices and other types of businesses in the building. The brickwork crowning the windows of the Fine Arts Building is now painted white, which accents it considerably in the 2006 picture. The tan colored brick building next door was home to the Lincoln Hotel as well as the Lee Gilliam Photo Studio then Super Office Services (the blue sign) and the F & L Café. Today the Lincoln Hotel is still there, its entrance next to Roots (a salon), Morrison Nails and a Big Town Hero sandwich shop. 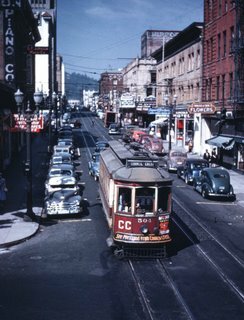 In the 1949 picture, the long vanished Playhouse Theater is visible a block west on the corner of 11th and Morrison. A block further can be seen the red brick Danmore Hotel, torn down last year by the First Presbyterian Church for its grounds and parking. 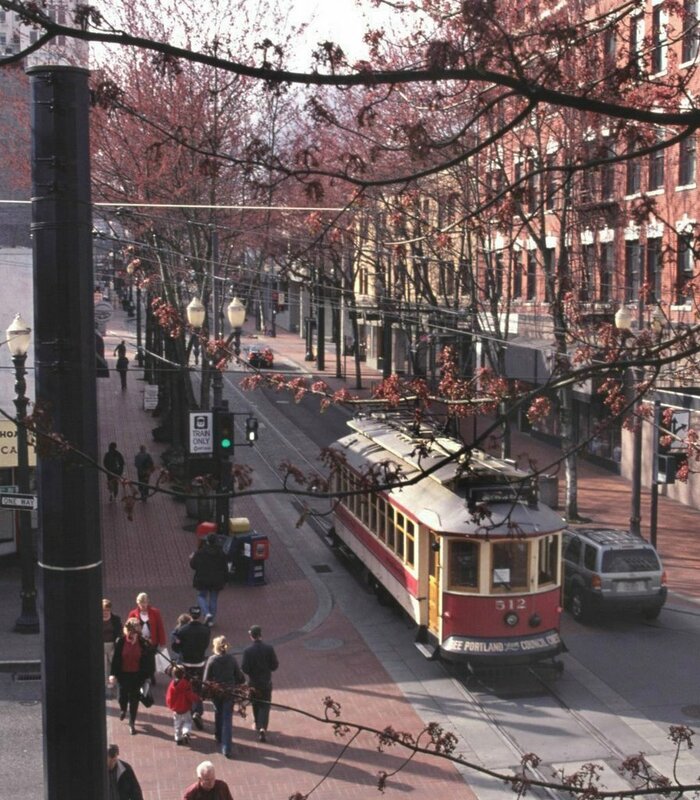 The trees and wide brick sidewalks were added during the Max line construction in the mid-1980s. According to the owner of Restoration Antiques the trees brought the welcome effect of cooling the front of the building during the hot days of summer. In 1949 Dorothy McCoullough Lee was Mayor of Portland. The old neighborhood south of the Civic Auditorium was untouched by urban renewal. Montgomery Park was the Montgomery Wards warehouse. There was no Fremont Bridge. The Hotel Portland was still standing in the middle of the city and Wilsonville, Tigard and Beaverton were small towns out in the country. There was no Interstate highway system. Ocean liners were the primary way to get to Europe and Asia. Harry Truman was President. The Korean War was a year away from starting. Although the close-in buildings in both pictures are the same, and the streetcars are similar, there is little that connects the two worlds in the photographs. People still shop on SW Morrison Street. They still eat and drink where the Elite Café, the Blaziers Millionaire and the F&L used to be. Music lessons are still given upstairs in the Fine Arts Building. There is a music store two doors down from Maya’s Taqueria. People still live the Lincoln Hotel. Trains and cars still share the street. From that perspective, how much have things really changed? After the photograph of car #504 at 10th and Morrison was taken, it continued on to SW 5th street where it turned north for one block to loop at SW Washington for its return trip to Council Crest. It then went up Washington Street to where it meets with Burnside, just west of the present day I-405 trench. The #504 would proceed up Burnside to Vista where it was met once again by the (unknown) photographer as it began its steep climb to Council Crest. The small building between Vista and Burnside housed a florist in 1949. Today it is a State Farm insurance office. The Tudor featured building was Murlark Hall, which once was home to dance and golf academies, a delicatessen and a soda fountain. 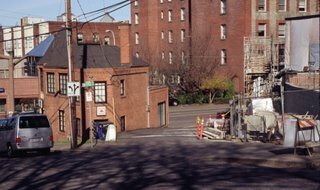 Across the street in the early 1900's, the Gambrinus Brewing Company (on the northwest corner of 23rd and the portion of Burnside then called Washington Street)had that most Portland of attractions, a beer garden. Vista at Burnside 2006. Two of the historic Council Crest Cars the #503 and #506, as well as Portland Railway Light and Power Company interurban car #1067 are preserved at the Oregon Electric Railway Historical Societies museum at Brooks Oregon (north of Salem) in need of support and restoration.